Background: For safe and effective therapy, drugs are supposed to be actively targeted at the desired disease locations. 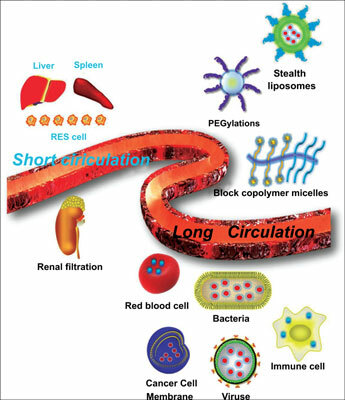 As a promising candidate for drug delivery, long circulating system with various strategies has been widely used. Recently, biomimetic strategies mediated long circulation of drug delivery system have been increasingly developed for forming various nanoparticles and shown the anticipated potential. Method: In this review, a variety of approaches for long circulation strategy have been surveyed, together with different modifications. The future perspectives as well as challenges in this field are also discussed. Results: Amounts of papers from nearly 5 years were included in the review, this review identified PEGylation, liposomal, biomimetic materials were the effective strategy for drug long circulation. Conclusion: The findings of this review confirm the importance of long circulation for drug delivery. Designing of a delivery system requires an appropriate balance between the stability of material and the long term circulation in body, which can be tailored to a specific application, based on experience optimization and customized design. Biomimetic design strategy is likely to revolutionize the current medical condition. In the medical field, using these emerging technologies on materials is promising to improving the traditional modalities and achieving novel applications on long circulation of delivery systems. Keywords: Long circulation, Drug delivery, PEGylations, liposomes, biomimetic modification, cell membrane. Keywords:Long circulation, Drug delivery, PEGylations, liposomes, biomimetic modification, cell membrane. Abstract:Background: For safe and effective therapy, drugs are supposed to be actively targeted at the desired disease locations. As a promising candidate for drug delivery, long circulating system with various strategies has been widely used. Recently, biomimetic strategies mediated long circulation of drug delivery system have been increasingly developed for forming various nanoparticles and shown the anticipated potential.